Size: 239 sq.ft. - 439 sq.ft. Bhakti Developer a renowned name in construction business welcoming a new residential "Bhakti Bellavue" project at Khopoli Mumbai. Bellavue brings a lifestyle that befits Royalty with the batch of magnificent Apartments at Khopoli. These Residential apartments in Khopoli offers limited edition luxury boutique houses in the city center. Bhakti Bellavue presents the most dynamic floor plans designed for a lavish lifestyle. Bhakti Bellavue is a large project spread over 1.99 acres of area. 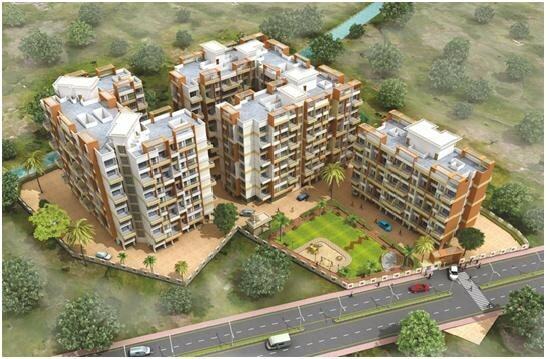 The construction comprises of 1 BHK, 1.5 BHK and 2 BHK Apartments. Bellavue is one of the residential development consists of 4 Towers whichoffering spacious and skillfully designed 1 BHK and 2 BHK apartments at very affordable prices. This affordable construction has taken place over 1.99 acres of land. 1 BHK homes ranges between 276 to 391 sq.ft carpet area & 2 BHK flats having carpet area of 426 sq.ft to 494 sq.ft. The project is well equipped with all the amenities to facilitate the needs of the residents with total 230 units in different sizes with open car parking area. Bhakti Bellavue is internally accessible through local buses & rickshaws which has a good connectivity & frequency. Khopoli is an industrial location at a distance of 50 kilometers from the Navi Mumbai. It is located in the Raigad district of Maharashtra. Khopoli is administrated and maintained by the Mumbai Metropolitan Region. The project bellavue is well placed & the surrounding is covered by entertainment options like Zenith waterfall, Khandala (8kms), Adlabs Imagica (9kms), Lonavala(11kms) and Panvel is around 35 kilometers from the site location. Bhakti Bellavue is in Khopoli near Navi Mumbai, Maharashtra. Out of the many world class facilitiesthe Bhakti Bellavueproject have attractive & rich amenities like club house, Fitness centre, Sand pit kids play area, Jogging track, Temple, Amphitheatre, Intercom facility, Indoor games, Basketball & Badminton courts, Rain water harvesting, 24 hours water supply, Stilt & open car parking facility, 24Hr Backup Electricity, Landscaped Garden, Earthquake Resistant, CCTV Cameras, Gymnasium, Intercom, Lift, Amphitheater and Open Lawns, Senior Citizen Park, Security, Yoga, Aerobics and Meditation Room. Schools: - Carmel Convent School, Buddhist International school, IVY English Medium School, Dipodills Nursery School. Hospitals: - Jakhotia Nursing Home, Thakur clinic, Anuja Nursing Home,Taj Hospital, Kulkarni Nursing Home, Vidya Prabha Hospital, Kejriwal Hospital. Shopping Malls: - Samuels Mall, Central Plaza, RD Fashion Collection, Alaina city plaza. Movie Theatres: -Gold Cinema, Samuel Cinema. Restaurants: - Swanand Hotel, Sagar Plaza Hotel, Deepak Hotel, Celebration Family Restaurant, McDonald's, KFC, Subways sandwiches, Nisarga Dhaba. Bus Stops: -Khopoli City (KMT) Bus Stand, State Transport Bus Halt, Khopoli Bus Station, Jagdish Nagar, Shil Phata Bus Stop. Parks: - Maharaja Lawns, Mahaveer Garden, Nehru Garden, Rajmachi Garden.